Mobile Printing 2013 - The year in review - We're getting somewhere!!! 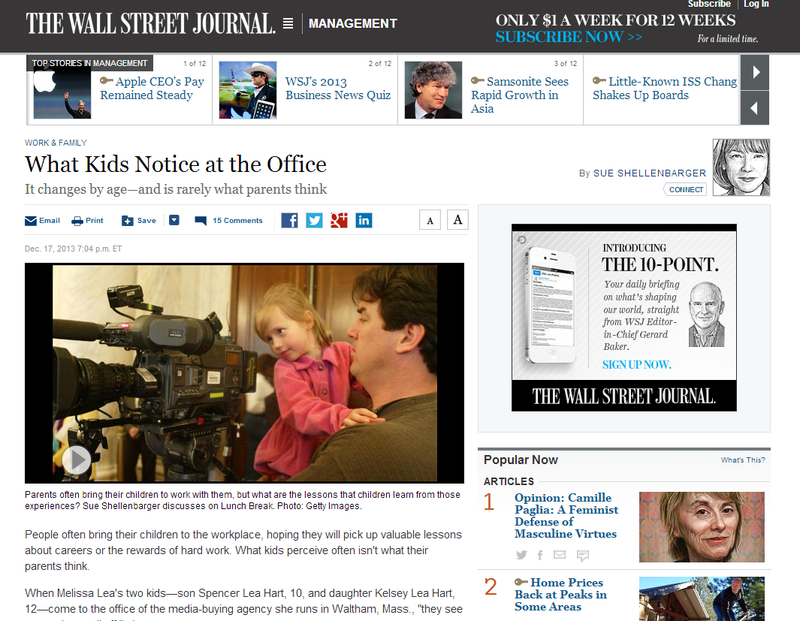 Innovation in mobile printing in 2014 will include marketing! Looking back on 2013, there were a considerable number of developments in the world of mobile printing, from players large and small. I have identified a few of what I consider both the key developments and remaining areas of opportunity. 1 - Narrowing down the printing process to the fewest possible steps! 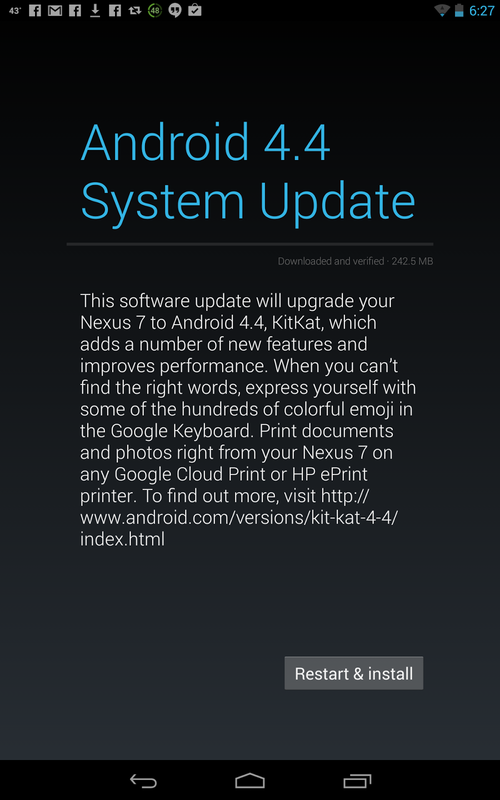 Users of both Android and iOS smartphones and tablets benefited from operating system revisions, specifically in KitKat (Android 4.4) and iOS7. Android's ability to print directly to HP printers in essentially one step (in addition to the existing Google Cloud Print option) is a breakthrough in ease-of-use (as I blogged about here), and other printer OEMs will need to catch up. On the Apple side, basic WiFi printing has never been simpler with iOS7, and that includes a plethora of available AirPrint wireless printers (an updated list, provided by Sam Costello @aboutipod, includes hundreds of printer and MFP models, from over 20 vendors, current as of November 2013). And the new iOS version, in a nod to business/enterprise users, also offers new Mobile Device Management (MDM) configuration options, including the ability to "configure accessibility options and AirPrint printers", according to Apple. More on this coming in early 2014! I had to wonder if we'd reached the ease-of-use tipping point just recently, when a friend (from outside the industry) asked me why it was so much more troublesome to print to his WiFi printer with his Windows laptop (with arcane steps for finding and setting up the printer in question) compared to how easy it was to print, essentially a "point and shoot" process, from his iPhone! 2 - The first significant "coming together" of printer industry players around mobile printing also took place in the latter part of 2013. The Mopria Alliance brings together Canon, HP, Samsung and Xerox, with "the shared goal of providing intuitively simple wireless printing from smartphones, tablets and other mobile devices", according to the Mopria website. On my Imaging Channel "Goin' Mobile" blog - which also debuted in 2013, making for at least another minor milestone in the mobile printing world, I took my own look at the alliance and its prospects (see "Mopria Alliance Brings Traditional Printing Rivals Together for Better Mobile Printing"). This will be "one to watch" in 2014, to see what tangible results may come out of it. 3 - Get back to the marketing and economics basics in 2014! The general behavior and attitude in this part of the printing and industry, going back to the beginning of the explosive growth in mobile devices' innovation and popularity, which I conveniently peg as the first Apple iPhone in mid-2007, has combined denial ("this won't hurt printing"), opportunity ("they'll print more if only they know how"), and posturing ("we have the best way to print from mobile"). That last characteristic, posturing as "the best", is starting to crack, with the Mopria alliance, recognizing that "all of printing" is in this together, and I see this as big progress. Better printing from mobile devices is probably not a long-term differentiator (albeit a nice first-to-market in the case of the aforementioned KitKat solution with HP.) And that "they'll print more" statement above, lacks any real understanding of customer needs and segments. With a billion-plus mobile-toting users around the world, there are so many different combinations of users' printing needs, and creative, targeted solutions need to start hitting the market. The photo up top, taken in a big box store on Christmas Eve this year, points to a beginning, with HP actually labeling one of their Officejets as a "smartphone and tablet printer". It is a small step but indicative of an important direction! I look forward to much more innovation to come, especially on the marketing side. Happy 2014!!! 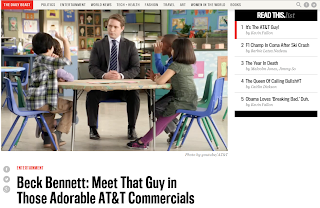 December 2013 Observations - Kids say the darnedest things! As so often happens, this month's column idea came together through a good bit of serendipity. I always have a “hopper” full of potential “Observations” subjects, but more often than not the confluence of several random tidbits gets me intrigued, and I go down a path I would not have been able to anticipate days or weeks before in putting together my monthly musings. This month’s subject is hinted at by the title (more on that at the end), but came about from a variety of stimuli. 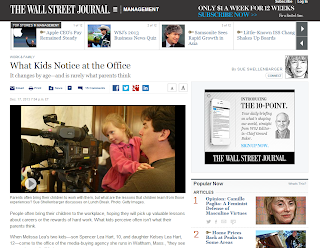 An important one was the The Wall Street Journal and a mid-December story in their "Work and Family" section, “What Kids Notice at the Office. It changes by age—and is rarely what parents think” . And while nothing specific about the article by Sue Shellenbarger was relevant to my normal printing and imaging subjects, it awakened my “looking at things through a different set of eyes” point-of-view. Especially with the holidays upon us, including my own good fortune of spending much of the time with my young grandchildren, sharing in the festivities and excitement and imagining how they are taking it all in, maybe it's a natural time to be thinking more generally about kids and the upcoming generation. It even made me go back to memories nearly twenty years old, and the still-enduring “visioning” project I wrote about here two years ago (see “November Observations: The Lasting Power of a Good Strategy…Or Two!”). In the course of that months-long cross-functional team exercise, and in one of our more breakthrough endeavors, our group interviewed middle-schoolers via focus group format, probing on their views towards printed material of many forms, and how those views might different from that of their elders. I also recalled watching my own young offspring, during that same era, interact with the office machines I would bring home from work (mostly LaserJets and ScanJets – go figure!). Overall, they delighted in “breaking the rules”, at least some of the time, as I recalled them trying to feed tiny Post-it stock into the manual page feeder of one of the printers (not so successfully, I might add), and (more successfully) making 3D scans of their action figures on the glass of the designed-for-2D page scanners. But the confluence was not yet complete. At the Business Imaging Expo, in Las Vegas, also in mid-December, I was fortunate to attend an excellent review of Ricoh’s marketing research into Millennials’ (aka Gen Y) overall attitudes and the “numerous changes taking place today as a result of generational gaps and differences”, according their press release leading up to the event, as presented by noted industry visionary and Ricoh’s America Corporation VP of Strategic Marketing, Terrie Campbell. Ricoh then followed with another release, covering both Campbell’s conference topics and others, as part of their “2014 Predictions”, that makes for very interesting reading, especially here at the turn of the year and, for many at least, a time for reflection. Much has been made of these generational differences, and the print and imaging industry has so often focused in on paper usage, and the veracity of the idea that Gen Y generally avoids print in favor of the electronic. Everyone, from retired HP printer chief Vyomesh Joshi, who a few years back worriedly admitted that his own daughters didn’t print, to a fellow industry analyst who argued with me that his own kids print more than he himself does, seems to have entered the debate. A study from 2011 by TRU, a division of TNS Research Global, and reported by Rochester Institute of Technology (RIT) Print-in-the-Mix website (http://printinthemix.com/research/show/88) declares mixed findings on this exact subject - which actually shouldn’t be surprising. In kudos to Campbell and Ricoh, they are looking beyond the simplistic “do they really print less” question, to the overall attitudes and preferences of those Millennials (born between 1980 and 1995, now aged from their late teens to their early thirties, and those same “kids” my team interviewed in 1993 as middle schoolers). This goes right along with Ricoh’s emphasis on “change management” as the higher-level pursuit that has guided their Managed Document Services efforts of the past few years. So it will be interesting to continue to follow their pursuit of business opportunities availed by the shifting generations. But before closing, a little more, as promised, on the title of this post. It is a reference to a segment of the same name from a 50s/60s TV talk show (but even before they were called talk shows, I think), where a folksy host would interview children and see what amusing answers they would come up with when responding to rather "grown -up" questions. 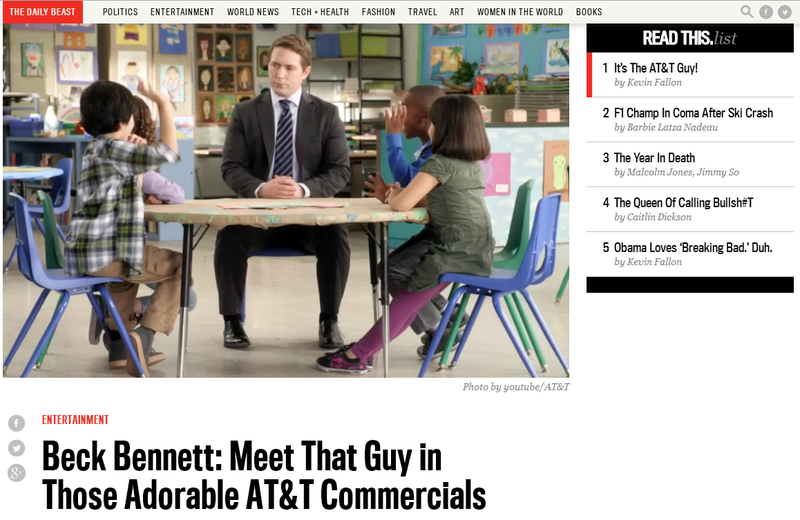 And that theme has continued to the current day on TV with the popular AT&T commercials (see illustration)! But despite the amusement factor, my recollections here have ended up on the little more serious side, of "what can we learn from younger people", and how might those burgeoning thoughts be translated into projections of changes to come based on shifting needs and values? HP now selling "Smartphone and tablet" printers! Greetings to all my readers! On my traditional "last minute" shopping trip this morning (Christmas Eve), I found this HP Officejet 4630 on an end-cap in the electronics section at Target. It's a "Smartphone and tablet" printer - how about that! Come back here, before the end of the year, for my recap of other significant mobile printing milestones, as well as my December Observations. But as for for now, I am out, and Happy Holidays! I am a bit delayed in posting these end-of-year (Q4FY13) printer results from HP. My Google Drive spreadsheet has been updated. Another day, and another hashtag. It must have to do with the looming end of the year 2013, but printing and imaging is hopping these days, with one exciting event following another. I am in Miami today, hosted by Nuance Communications and their Imaging Division. While I've signed a non-disclosure agreement prohibiting me from describing anything we are being shown today (at least for the time being), let it be said that the company that offers industry-leading capture, document management, and managed print solutions (think Ecopy, PaperPort, Equitrac and PDF Converter, among many others), has much more up its sleeve, and also more complete integration across its existing and future product/solution portfolio. Stay tuned! I am not here for the NFR or the ACA (National Finals Rodeo and American Country Awards), but they provide a fun backdrop. The real action is at the Business Imaging Expo, where the information is flowing at a furious pace. Best way to keep up? Twitter and #BIX2013 - hashtags are the thing these days, anyway. Those acronyms seem so 1990 don't they? Nexus 7 Printing - You've Come a Long Way! As I've prepared for the upcoming Business Imaging Expo and my seminar on mobile printing, I have enjoyed the opportunity to survey the state of the industry. My work in this market space, over time, has allowed me to observe the evolving relationship between mobile devices (and their users) and printing and imaging. One area I will highlight next week is the developments in printing from Google's Android OS. 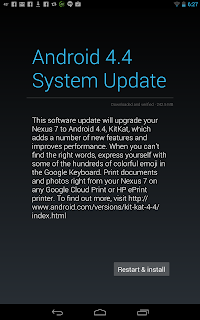 As the recent screenshot (see above) shows (via one of my Nexus 7 tablet computers), the new KitKat version (Android 4.4) offers not one but two integrated print options, one for printing to Google Cloud Print and one for printing to HP ePrint printers. I have now put these options to the test, and will be reporting on them next week (in person) as well as via expanded blog posts. My original "Nexus 7 Printing" post, appearing here last July, reported on my printing experiences with the first generation of the Asus/Google tablet, and its reliance on third-party apps. So the built-in printing featured in KitKat represents significant progress, both from Google as well as HP, again in the lead position with a significant mobile printing opportunity. I am very much looking forward to next week at the Business Imaging Expo, to discuss the state of Android-based printing, along with so much more, and of course, look forward to further developments in the mobile printing world in 2014 and beyond! For some time, I have been pointed towards this column as one of significance, and not exactly because it represents a “round” number. 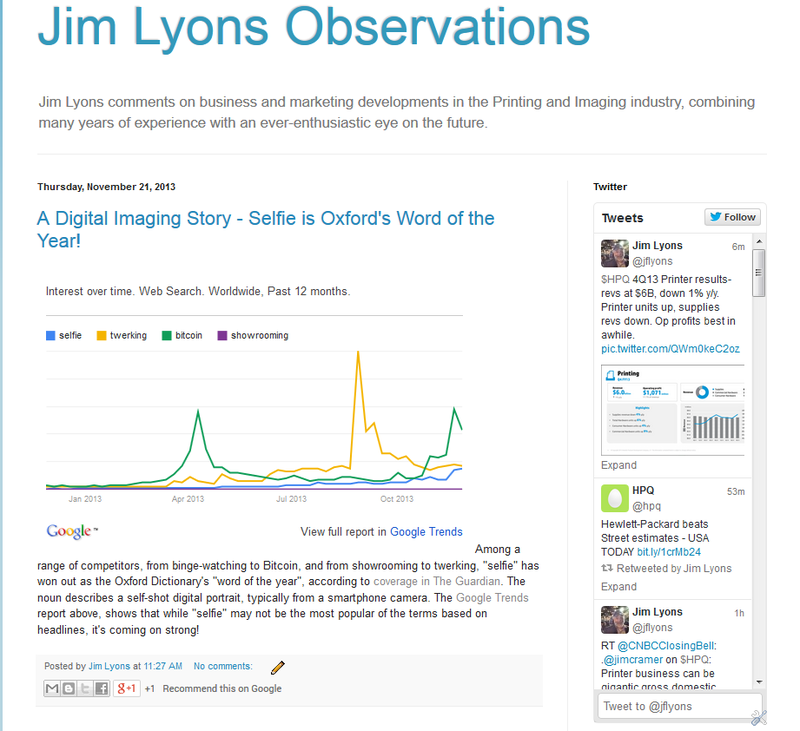 My November 2013 Observations is Number 96 in my series of monthly posts which began in December, 2005, just after I had left 25 years in the employment of Hewlett Packard, most of those in the imaging and printing business, and most of those associated directly with the LaserJet product line. And in re-thinking the round-numbered-ness of eight years (as opposed to the more obvious ten), perhaps it’s a change in my thinking, and seeing the beauty and symmetry of two-to-the-third power (the first and second of the prime numbers after all) signified by eight years. My recent and I might add successful completion of Stanford Math Professor Keith Devlin’s “MOOC” (Massively Open Online Course) no doubt has something of an impact. You might recognize Dr. Devlin as the “Math Guy” on NPR’s Weekend Edition, my first encounter with him, but his “Introduction to Mathematical Thinking”, taken through Coursera.com, is a great online course that exercised my mind and truly gave me new perspectives on logic and language. In that original Observations, I played off my final days at HP and discovering some ten-year-old Hard Copy Observers (dating to the end of 1995). In “Observations: Hard Copy Time Capsule”, I played up some of the obvious differences a decade makes in a technology-based business like ours. This included, in 1995, the “newness” of multifunction machines, shifting tides in the channel and trade show worlds, and the lack of presence (in a commercial, mass market sense anyway) of things now taken as so basic such as digital photography and the internet. This ran in the December 2005 issue of The Hard Copy Observer (HCO), and was intended as a one-time, “guest editorial” feature. But thanks to the encouragement of Lyra Research and HCO founder Charles LeCompte, and HCO managing editor Ann Priede, it became a monthly feature, and also led to other writing and analysis opportunities, both with Lyra and then the Photizo Group, in two different stints for me, the second coming when Photizo acquired Lyra in early 2012. And the connections made via the column, as well as its “frequency and reach”, has led to opportunities to cover as well as occasionally consult for a wide range of industry participants, which continues today. 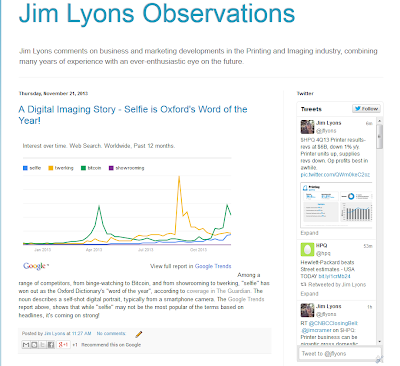 The blog “Jim Lyons Observations” didn’t actually come into being until March 2006, but the posts, starting with that premier “Time Capsule” piece, were immediately put up online – a move which came thanks to my publishing-industry-oriented, young-adult children, who advised establishing ownership of my by-lined material via a second, personally-owned “publication”. But the blog soon become more than a legal entity, with more than 700 other posts since, to go with my (now) 96 monthly observations. That pace of blog posting, by the way, has slackened off considerably over recent years, replaced for the most part, content-wise, by my frequent tweets. Though these “micro-blog” Twitter entries (now over 20,000) run the gamut with only a portion of them dedicated to printing and imaging, they appear as part of the “look” of my current blog (see above). In the blending of personal and professional worlds, my followers also find out about my among other topics , my sporting interests, photography efforts (often via linked Instagram and Foursquare posts), sense of humor, and recent fascination with mobile technology and its latest wearable iteration, personally experienced by my being a Google Glass Explorer. And I would be negligent in rounding up my social media activity without including LinkedIn – a valued business tool which I use virtually every day, with much activity directed to keeping up with people in our industry, both from their past lives as well as current activities. When working on “Observations” I frequently seek out or “get to know” industry players via their LinkedIn profiles, often leading to in-person interviews and/or email correspondence. This time around, I only need to look back on the paragraphs above, to find MOOCs, Twitter, Instagram, Foursquare, LinkedIn, and Google Glass mentioned – each were virtually if not totally unknown in 2005. And that doesn’t even get into iPhones, iPads, Chromebooks, and Anroids! So without getting into more cliches (though “the more things change…” comes to mind), I would also like to thank, in addition to those already mentioned, the cast of thousands I’ve met along the way, as well as my current editors and publisher (including the current home for Jim Lyons Observations) at 1105 Media, Larry Barrett, Amy Weiss and Patricia Ames – great folks who I can’t wait to meet up with again face-to-face at the upcoming Business Imaging Expo in Las Vegas!